Encouraged by his victory at Second Bull Run, about 30 miles from Washington, Confederate Gen. Robert E. Lee slides by the nation’s capital and heads north, scaring the daylights out of loyal citizens in Maryland, Pennsylvania, and points north. This is part of Lee’s “offensive-defensive” strategy, an effort with at least four (1) objectives: knock a very large hole in Northern morale, (2 regain Maryland for the Confederacy, (3) persuade England and France to recognize the Confederacy, and (4) scoop up some fodder and supplies from the lush Northern countryside. Oh, and it would be nice to wipe out McClellan’s Army of the Potomac if that fastidious and slow-moving Union commander offers an opening. So Lee moves west of Maryland’s South Mountain, McClellan east. Averaging 1,300 feet in height, South Mountain is a 50-mile-long ridge dividing eastern Maryland from its western panhandle. On Sunday Sept. 14, fighting breaks out at numerous passes over the mountain as Lee’s Confederates attempt to hold back McClellan’s Union forces, who are trying to get at Lee west of the mountain. The Confederates fail to stop the Union soldiers, whose superior numbers blast their way through the passes. But the delay has allowed Lee and Jackson to arrange their forces on the high ground near, near Sharpsburg, Maryland. On Monday, Sept. 15, Stonewall Jackson captures Harpers Ferry,Virginia (now West Virginia) taking 12,000 Union soldiers prisoner following a less-than-spirited defense. For that weak-hearted defense, soldiers blame Dixon S. Miles, the Union commander,. Dixon just happens to be killed shortly before the surrender…possibly by “friendly fire” from Union artillery manned by frustrated soldiers. By Wednesday, Sept. 17, Lee, joined by Stonewall Jackson, has stationed his Confederates on the high ground west of Antietam creek, near Sharpsburg. Having moved too slowly to get there first, McClellan now must fight his way uphill. But he has about 87,000 men to Lee’s 45,000. Once again, McClellan botches things. Instead of throwing everything he has at Lee, he attacks piecemeal, the attacks moving southward in the course of the day. The first, against Jackson, is finally stalled, and the second, at mid-day against the Confederate center, runs into a buzz saw featuring diehard Confederates hunkered down in “The Sunken Road,” soon to be known as “Bloody Lane.” Bodies pile up in heaps. The third attac, in the afternoon, finally carries a stone bridge (still standing and now known as “Burnside Bridge”) and flows into Sharpsburg. But then Confederate Gen. A. P. Hill’s forces arrive, dressed in Union uniforms captured at Harpers Ferry. The Union attack stalls. Thursday, Sept. 18 passes relatively quietly, neither side moving. Having taken heavy losses and realizing he is badly outnumbered, Lee removes his troops during the night of Sept. 18-19. Union soldiers awake Friday morning to find the enemy gone. Because Lee retreated, leaving the field to McClellan, this is considered a union victory. 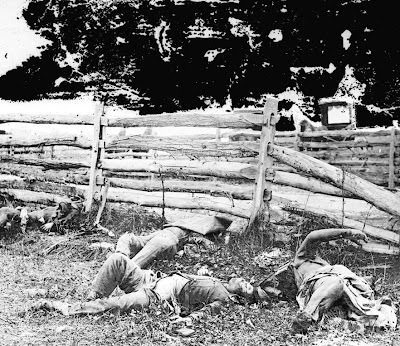 But Antietam will be remembered for two things: it was the bloodiest single day in the Civil War, taking (from both sides) over 3,600 lives and wounding over 17,000 men. A total of about 1,800 men, from both sides, were missing or captured. If McClellan had moved faster and used more of his men, he might have exacted a crushing defeat, instead of a “hollow victory.” But a win is a win, and on Saturday, Sept. 20, President Lincoln is emboldened to draft the Emancipation Proclamation, intending to issue it on Monday, to take effect next January. Elsewhere, on Saturday, Sept. 20, Ohio’s Maj. Gen. William S. Rosecrans defeats Confederate Gen. Sterling “Pap” Price at Iuka, Mississippi. However, Rosecrans’ superior, Maj. Gen. Ulysses S. Grant, blames Rosecrans for not pursuing Price with enough vigor and destroying him. Grant will never forgive or forget this failure. So, as autumn arrives, Confederate attempts to retake the initiative from the Union, have failed, both in the eastern and western theaters. Northern civilians breathe easier, Europe declines to recognize the Confederacy, and freedom looms for many of the South's slaves. It i the hours and days just after a battle that can be the worst. For the losers, there is crushing shame spiked with fear of capture as they attempt to flee. But for the winners occupying the battlefield, the triumph is dampened by the cost of victory. The field is littered with the wreckage of men and equipment. Scattered among the smashed cannon and discarded rifles and knapsacks are hundreds of bodies, some motionless, some moaning, waiting for aid that—in some cases—may never come. Because Civil War battles are fought most frequently during warm weather, the wounded men beg for water as they lie unsheltered, exposed to a broiling sun. Surviving soldiers roam the battlefield, looking for comrades, scavenging for supplies. (Hartzell took a pair of new socks from the corpse of a Confederate.) As the days go by, some of the wounded men—left behind by their own army--remain on the field while others die. Worms infest open wounds of living men and terrible odors arise from decaying corpses. The best that many of these corpses will receive is a hasty burial in a trench or shallow grave near where they fell, the men’s identities disappearing beneath the earth, their families left to wonder why their letters have stopped coming. 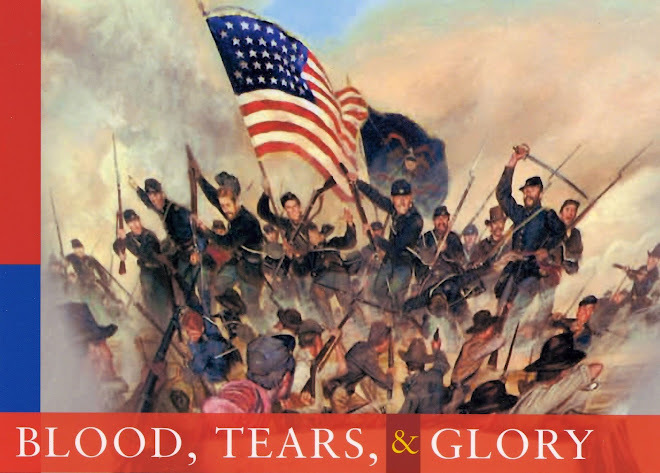 So it is after the battle of Second Manassas (also known as II Bull Run). The battle had peaked on Saturday, August 31 as Col. Nathaniel McLean’s “Ohio Brigade” made a goal-line stand on Henry House Hill. At heavy cost, McLean’s men hold back Lee’s Confederates just long enough for most of Union Gen. John Pope’s Army of Virginia to escape the field and head for the safety of the nation’s capital, 30 miles away. By Sunday, Pope has his tattered army gathered around Centreville, on the Washington side of Bull Run Creek, the soldiers panicky, officers angry at poor leadership by the generals. Soon, the generals themselves will be going public, blaming each other, a circular firing squad with Pope squarely in the middle. Two fresh corps from the lead-footed Maj. Gen. George B. McClellan finally have arrived to reinforce Pope, but it is too late to strike back at Lee and save the day. Lee has come up short as well. Still on the opposite side of Bull Run, he is unable to cut off Pope’s fighting retreat and so Lee cannot finish the battle by destroying his enemy. By and large, Pope’s army, though severely mauled, is able to escape to the shelter of Washington’s defenses. But not Pope. As much as Pope blames others—especially McClelland and Fitz-John Porter—it is clear to Lincoln and General-in-chief Halleck that responsibility for the defeat rests most of all on the loud-mouthed Illinoisan. By the end of the week, Pope will lose his command and be assigned to fight Indians far from the war’s main stages. Pope’s departure is not a surprise, but what happens to McClellan is. Despite urging from Secretary of War Stanton and others, Lincoln refuses to dismiss Little Mac. Instead, McClellan not only keeps command of the Army of the Potomac but is given the task of folding into it Pope’s old command, the Army of Virginia. Lincoln's advisers gnash their teeth, but the President knows what he is doing. McClellan tends to fade under the pressure of battle, but he is a superb organizer, trainer—and inspirer—of men. Right now, that is what is needed most of all. Lincoln needs McClellan's special gifts to restore the Union’s main army in the East to fighting form.